اس موضوع اتے گھٹّ تکنیکی جان-پچھان اتے ہور زیادہ قابل رسائی جان-پچھان لئی ویکھو، M-تھیوری نال جان-پچھان. سٹرنگ تھیوری ڈیولٹیاں بارے اک چتر. Yellow arrows indicate S-duality. Blue arrows indicate T-duality. (2009) Dirichlet Branes and Mirror Symmetry. American Mathematical Society. ISBN 978-0-8218-3848-8. Banks, Tom; Fischler, Willy; Schenker, Stephen; Susskind, Leonard (1997). "M theory as a matrix model: A conjecture". Physical Review D 55 (8): 5112–5128. doi:10.1103/physrevd.55.5112. Bibcode: 1997PhRvD..55.5112B. (2007) String theory and M-theory: A modern introduction. Cambridge University Press. ISBN 978-0-521-86069-7. Bekenstein, Jacob (1973). "Black holes and entropy". Physical Review D 7 (8): 2333–2346. doi:10.1103/PhysRevD.7.2333. Bibcode: 1973PhRvD...7.2333B. Bergshoeff, Eric; Sezgin, Ergin; Townsend, Paul (1987). "Supermembranes and eleven-dimensional supergravity". Physics Letters B 189 (1): 75–78. doi:10.1016/0370-2693(87)91272-X. Bibcode: 1987PhLB..189...75B. Borcherds, Richard (1992). "Monstrous moonshine and Lie superalgebras". Inventiones Mathematicae 109 (1): 405–444. doi:10.1007/BF01232032. Bibcode: 1992InMat.109..405B. Candelas, Philip; de la Ossa, Xenia; Green, Paul; Parks, Linda (1991). "A pair of Calabi–Yau manifolds as an exactly soluble superconformal field theory". Nuclear Physics B 359 (1): 21–74. doi:10.1016/0550-3213(91)90292-6. Bibcode: 1991NuPhB.359...21C. Candelas, Philip; Horowitz, Gary; Strominger, Andrew; Witten, Edward (1985). "Vacuum configurations for superstrings". Nuclear Physics B 258: 46–74. doi:10.1016/0550-3213(85)90602-9. Bibcode: 1985NuPhB.258...46C. Castro, Alejandra; Maloney, Alexander; Strominger, Andrew (2010). "Hidden conformal symmetry of the Kerr black hole". Physical Review D 82 (2). doi:10.1103/PhysRevD.82.024008. Bibcode: 2010PhRvD..82b4008C. Connes, Alain; Douglas, Michael; Schwarz, Albert (1998). "Noncommutative geometry and matrix theory". Journal of High Energy Physics 19981 (2): 003. doi:10.1088/1126-6708/1998/02/003. Bibcode: 1998JHEP...02..003C. Cremmer, Eugene; Julia, Bernard; Scherk, Joel (1978). "Supergravity theory in eleven dimensions". Physics Letters B 76 (4): 409–412. doi:10.1016/0370-2693(78)90894-8. Bibcode: 1978PhLB...76..409C. de Haro, Sebastian; Dieks, Dennis; 't Hooft, Gerard; Verlinde, Erik (2013). "Forty Years of String Theory Reflecting on the Foundations". Foundations of Physics 43 (1): 1–7. doi:10.1007/s10701-012-9691-3. Bibcode: 2013FoPh...43....1D. (1999) Quantum Fields and Strings: A Course for Mathematicians 1. American Mathematical Society. ISBN 978-0821820124. Duff, Michael (1996). "M-theory (the theory formerly known as strings)". International Journal of Modern Physics A 11 (32): 6523–41. doi:10.1142/S0217751X96002583. Bibcode: 1996IJMPA..11.5623D. Duff, Michael (1998). "The theory formerly known as strings". Scientific American 278 (2): 64–9. doi:10.1038/scientificamerican0298-64. Duff, Michael; Howe, Paul; Inami, Takeo; Stelle, Kellogg (1987). "Superstrings in D=10 from supermembranes in D=11". Nuclear Physics B 191 (1): 70–74. doi:10.1016/0370-2693(87)91323-2. Bibcode: 1987PhLB..191...70D. (2004) Abstract Algebra. Wiley. ISBN 978-0-471-43334-7. Eguchi, Tohru; Ooguri, Hirosi; Tachikawa, Yuji (2011). "Notes on the K3 surface and the Mathieu group M24". Experimental Mathematics 20 (1): 91–96. doi:10.1080/10586458.2011.544585. (1988) Vertex Operator Algebras and the Monster, Pure and Applied Mathematics 134. Academic Press. ISBN 0-12-267065-5. Moonshine Beyond the Monster: The Bridge Connecting Algebra, Modular Forms, and Physics. Cambridge University Press. Givental, Alexander (1996). "Equivariant Gromov-Witten invariants". International Mathematics Research Notices 1996 (13): 613–663. doi:10.1155/S1073792896000414. Givental, Alexander (1998). "A mirror theorem for toric complete intersections". Topological field theory, primitive forms and related topics: 141–175. doi:10.1007/978-1-4612-0705-4_5. ISBN 978-1-4612-6874-1. Gubser, Steven; Klebanov, Igor; Polyakov, Alexander (1998). "Gauge theory correlators from non-critical string theory". Physics Letters B 428: 105–114. doi:10.1016/S0370-2693(98)00377-3. Bibcode: 1998PhLB..428..105G. Guica, Monica; Hartman, Thomas; Song, Wei; Strominger, Andrew (2009). "The Kerr/CFT Correspondence". Physical Review D 80 (12). doi:10.1103/PhysRevD.80.124008. Bibcode: 2009PhRvD..80l4008G. Hawking, Stephen (1975). "Particle creation by black holes". Communications in Mathematical Physics 43 (3): 199–220. doi:10.1007/BF02345020. Bibcode: 1975CMaPh..43..199H. Hawking, Stephen (2005). "Information loss in black holes". Physical Review D 72 (8). doi:10.1103/PhysRevD.72.084013. Bibcode: 2005PhRvD..72h4013H. Hořava, Petr; Witten, Edward (1996). "Heterotic and Type I string dynamics from eleven dimensions". Nuclear Physics B 460 (3): 506–524. doi:10.1016/0550-3213(95)00621-4. Bibcode: 1996NuPhB.460..506H. (2003) Mirror Symmetry. American Mathematical Society. ISBN 0-8218-2955-6. Hull, Chris; Townsend, Paul (1995). "Unity of superstring dualities". Nuclear Physics B 4381 (1): 109–137. doi:10.1016/0550-3213(94)00559-W. Bibcode: 1995NuPhB.438..109H. Kapustin, Anton; Witten, Edward (2007). "Electric-magnetic duality and the geometric Langlands program". Communications in Number Theory and Physics 1 (1): 1–236. doi:10.4310/cntp.2007.v1.n1.a1. Bibcode: 2007CNTP....1....1K. Klarreich, Erica. "Mathematicians chase moonshine's shadow". https://www.quantamagazine.org/20150312-mathematicians-chase-moonshines-shadow/. Retrieved on March 2015. Klebanov, Igor; Maldacena, Juan (2009). "Solving Quantum Field Theories via Curved Spacetimes" (PDF). Physics Today 62: 28–33. doi:10.1063/1.3074260. Bibcode: 2009PhT....62a..28K. http://www.sns.ias.edu/~malda/Published.pdf. Retrieved on مئی 2013. Kontsevich, Maxim (1995). "Homological algebra of mirror symmetry". Proceedings of the International Congress of Mathematicians: 120–139. Bibcode: 1994alg.geom.11018K. Kovtun, P. K.; Son, Dam T.; Starinets, A. O. (2001). "Viscosity in strongly interacting quantum field theories from black hole physics". Physical Review Letters 94 (11): 111601. doi:10.1103/PhysRevLett.94.111601. PMID 15903845. Bibcode: 2005PhRvL..94k1601K. Lian, Bong; Liu, Kefeng; Yau, Shing-Tung (1997). "Mirror principle, I". Asian Journal of Math 1: 729–763. Bibcode: 1997alg.geom.12011L. Lian, Bong; Liu, Kefeng; Yau, Shing-Tung (1999a). "Mirror principle, II". Asian Journal of Math 3: 109–146. Bibcode: 1999math......5006L. Lian, Bong; Liu, Kefeng; Yau, Shing-Tung (1999b). "Mirror principle, III". Asian Journal of Math 3: 771–800. Bibcode: 1999math.....12038L. Lian, Bong; Liu, Kefeng; Yau, Shing-Tung (2000). "Mirror principle, IV". Surveys in Differential Geometry 7: 475–496. doi:10.4310/sdg.2002.v7.n1.a15. Bibcode: 2000math......7104L. Luzum, Matthew; Romatschke, Paul (2008). "Conformal relativistic viscous hydrodynamics: Applications to RHIC results at سانچہ:Radical=200 GeV". Physical Review C 78 (3). doi:10.1103/PhysRevC.78.034915. Maldacena, Juan (1998). "The Large N limit of superconformal field theories and supergravity". Advances in Theoretical and Mathematical Physics 2: 231–252. doi:10.1063/1.59653. Bibcode: 1998AdTMP...2..231M. Maldacena, Juan (2005). "The Illusion of Gravity". Scientific American 293 (5): 56–63. doi:10.1038/scientificamerican1105-56. PMID 16318027. Bibcode: 2005SciAm.293e..56M. http://www.sns.ias.edu/~malda/sciam-maldacena-3a.pdf. Retrieved on جولائی 2013. Maldacena, Juan; Strominger, Andrew; Witten, Edward (1997). "Black hole entropy in M-theory". Journal of High Energy Physics 1997 (12). doi:10.1088/1126-6708/1997/12/002. Merali, Zeeya (2011). "Collaborative physics: string theory finds a bench mate". Nature 478 (7369): 302–304. doi:10.1038/478302a. PMID 22012369. Bibcode: 2011Natur.478..302M. Moore, Gregory (2005). "What is ... a Brane?" (PDF). Notices of the AMS 52: 214. http://www.ams.org/notices/200502/what-is.pdf. Retrieved on جون 2013. Nahm, Walter (1978). "Supersymmetries and their representations". Nuclear Physics B 135 (1): 149–166. doi:10.1016/0550-3213(78)90218-3. Bibcode: 1978NuPhB.135..149N. Nekrasov, Nikita; Schwarz, Albert (1998). "Instantons on noncommutative R4 and (2,0) superconformal six dimensional theory". Communications in Mathematical Physics 198 (3): 689–703. doi:10.1007/s002200050490. Bibcode: 1998CMaPh.198..689N. Ooguri, Hirosi; Strominger, Andrew; Vafa, Cumrun (2004). "Black hole attractors and the topological string". Physical Review D 70 (10). doi:10.1103/physrevd.70.106007. Polchinski, Joseph (2007). "All Strung Out?". American Scientist. http://www.americanscientist.org/bookshelf/pub/all-strung-out. Retrieved on اپریل 2015. Penrose, Roger (2005). The Road to Reality: A Complete Guide to the Laws of the Universe. Knopf. ISBN 0-679-45443-8. Randall, Lisa; Sundrum, Raman (1999). "An alternative to compactification". Physical Review Letters 83 (23): 4690–4693. doi:10.1103/PhysRevLett.83.4690. Bibcode: 1999PhRvL..83.4690R. Sachdev, Subir (2013). "Strange and stringy". Scientific American 308 (44): 44–51. doi:10.1038/scientificamerican0113-44. Bibcode: 2012SciAm.308a..44S. Seiberg, Nathan; Witten, Edward (1999). "String Theory and Noncommutative Geometry". Journal of High Energy Physics 1999 (9): 032. doi:10.1088/1126-6708/1999/09/032. Bibcode: 1999JHEP...09..032S. Sen, Ashoke (1994a). "Strong-weak coupling duality in four-dimensional string theory". International Journal of Modern Physics A 9 (21): 3707–3750. doi:10.1142/S0217751X94001497. Bibcode: 1994IJMPA...9.3707S. Sen, Ashoke (1994b). "Dyon-monopole bound states, self-dual harmonic forms on the multi-monopole moduli space, and SL(2,Z) invariance in string theory". Physics Letters B 329 (2): 217–221. doi:10.1016/0370-2693(94)90763-3. Bibcode: 1994PhLB..329..217S. Smolin, Lee (2006). The Trouble with Physics: The Rise of String Theory, the Fall of a Science, and What Comes Next. New York: Houghton Mifflin Co.. ISBN 0-618-55105-0. Strominger, Andrew (1998). "Black hole entropy from near-horizon microstates". Journal of High Energy Physics 1998 (2): 009. doi:10.1088/1126-6708/1998/02/009. Bibcode: 1998JHEP...02..009S. Strominger, Andrew; Vafa, Cumrun (1996). "Microscopic origin of the Bekenstein–Hawking entropy". Physics Letters B 379 (1): 99–104. doi:10.1016/0370-2693(96)00345-0. Bibcode: 1996PhLB..379...99S. Strominger, Andrew; Yau, Shing-Tung; Zaslow, Eric (1996). "Mirror symmetry is T-duality". Nuclear Physics B 479 (1): 243–259. doi:10.1016/0550-3213(96)00434-8. Bibcode: 1996NuPhB.479..243S. (2005) The Cosmic Landscape: String Theory and the Illusion of Intelligent Design. Back Bay Books. ISBN 978-0316013338. (2008) The Black Hole War: My Battle with Stephen Hawking to Make the World Safe for Quantum Mechanics. Little, Brown and Company. ISBN 978-0-316-01641-4. (1984) General Relativity. University of Chicago Press. ISBN 978-0-226-87033-5. (1987) Anthropic bound on the cosmological constant 59. Physical Review Letters, 2607. Witten, Edward (1995). "String theory dynamics in various dimensions". Nuclear Physics B 443 (1): 85–126. doi:10.1016/0550-3213(95)00158-O. Bibcode: 1995NuPhB.443...85W. Witten, Edward (1998). "Anti-de Sitter space and holography". Advances in Theoretical and Mathematical Physics 2: 253–291. Bibcode: 1998AdTMP...2..253W. Woit, Peter (2006). Not Even Wrong: The Failure of String Theory and the Search for Unity in Physical Law. Basic Books, 105. ISBN 0-465-09275-6. (2010) The Shape of Inner Space: String Theory and the Geometry of the Universe's Hidden Dimensions. Basic Books. ISBN 978-0-465-02023-2. Zee, Anthony (2010). Quantum Field Theory in a Nutshell, 2nd, Princeton University Press. ISBN 978-0-691-14034-6. (2009) A First Course in String Theory. Cambridge University Press. ISBN 978-0-521-88032-9. Greene, Brian (2003). The Elegant Universe: Superstrings، Hidden Dimensions، and the Quest for the Ultimate Theory. New York: W.W. Norton & Company. ISBN 0-393-05858-1. Greene, Brian (2004). The Fabric of the Cosmos: Space، Time، and the Texture of Reality. New York: Alfred A. Knopf. ISBN 0-375-41288-3. Smolin, Lee (2006). 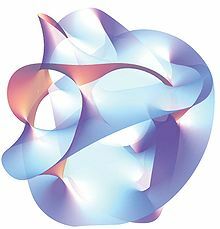 The Trouble with Physics: The Rise of String Theory، the Fall of a Science، and What Comes Next. New York: Houghton Mifflin Co.. ISBN 0-618-55105-0. (2012) Superstring theory. Vol. 1: Introduction. Cambridge University Press. ISBN 978-1107029118. (2012) Superstring theory. Vol. 2: Loop amplitudes، anomalies and phenomenology. Cambridge University Press. ISBN 978-1107029132. (1998) String Theory Vol. 1: An Introduction to the Bosonic String. Cambridge University Press. ISBN 0-521-63303-6. Polchinski, Joseph (1998). String Theory Vol. 2: Superstring Theory and Beyond. Cambridge University Press. ISBN 0-521-63304-4. (1999) Quantum Fields and Strings: A Course for Mathematicians، Vol. 2. American Mathematical Society. ISBN 978-0821819883.